1001 Jigsaw. World Tour - play and journey across Africa! 1001 Jigsaw. 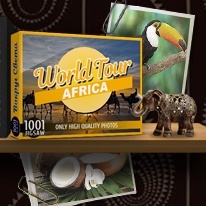 World Tour: Africa is an exciting puzzle game and and a great opportunity to experience the true atmosphere of Africa. Assemble jigsaws from a multitude of pieces and learn the history, traditions and attractions of the Africa in 500 high-quality photos. Now you can play your favorite puzzle game and travel your favorite capital at the same time, all without leaving the house! 1001 Puzzles. Around the World: Africa is a game and an inspiration. 500 photos of high quality: famous sights, architecture, monuments, art, traditions, history, cooking, nature ... Real and unique! And you can start your hot journey right now! - Get 500 puzzles for one purchase!